At the IARC 2018 conference in Vienna, the Müller-Guttenbrunn Group spoke about the recycling of plastics from ELV’s and WEEE. The presentation focused on current debates about for substances of concern in plastics and how these discussions have the potential to put an end to the recycling of these technical Plastics. After years of stagnation, the European recycling industry is finally experiencing a revival. The main triggers are the EU Circular Economy Package and the planned EU plastic strategy. While the EU Council, the EU Parliament and the EU Commission have already agreed on the Circular Economy Package, the EU’s plastic strategy is still at an earlier stage: The strategy was presented by the EU Commission only in January 2018. However, recent talks between the EU environment ministers indicate that a broad consensus can also be expected here. This is good news for the recycling industry, Olivier François, Market Development Officer at Galloo Recycling, said at the International Automobile Recycling Congress IARC 2018 in Vienna. Nevertheless, the EU’s plastic strategy is also a major challenge. Up to now, only six percent of the plastics put on the market have been recycled. This corresponds to a recycled quantity of 2.94 million tonnes. However, if the EU plastic strategy becomes a reality, a total of 10 million tonnes of plastics should be recycled by 2025 – an increase of around seven million tonnes. All this is to be achieved through voluntary commitments by industry. Julien van Damme, Recycling Manager at Honda Motor Europe, emphasized that automotive manufacturers have long been focusing on the development and recovery of recyclable components. Meanwhile, the technologies have been improved in such a way that not only metals but also plastics can be recovered sorted by type. The recycled plastics are now comparable to virgin material. The problem, however, is that the legislature also partially hinders the use of recycled materials, van Damme said. Strict rules on the presence of certain chemicals would ensure that certain plastics, including those from end-of-life vehicles, would no longer be allowed to be used. This is a waste of valuable materials, which in the worst case would have to be replaced by fossil raw materials. Chris Slijkhuis of the MGG argued along similar lines. The total amount of plastics used in electronics and vehicles amounts to around 8 million tonnes, he told the IARC 2018. Of this amount, around 65 percent would consist of recyclable components so that technical plastics can be produced again. The remainder of this solid plastic waste fraction consists of a wide variety of plastics that to date are not recycled. These plastics include plastics with Brominated Flame Retardants (BFRs), which can be found in both End-of-Life Vehicles (ELV’s) and in Waste from Electronics (WEEE) in parts that are often located near heat sources (such as engines and power supplies). These plastics with Brominated Flame Retardants (BFR’s) are separated and incinerated in order to eliminate these BFR’s, since some of them are considered to be Persistent Organic Pollutants (POP’s). But currently there is an actual discussion the thresholds of a newly defined POP Flame retardant. If this threshold is set at a very low level, the recycling of engineering plastics from WEEE and ELV’s would become impossible. „A decision in this direction would be devastating for the recycling targets of WEEE and ELV’s that are set within the EU”, Slijkhuis warned and continued “An approach balancing the energy saving and CO2 emissions reducing aspects of plastic recycling with the requirements to quickly eliminate POP BFRs as legacy substance is absolutely required”. The MGG Metrec facility in Amstetten treats ELV’s and WEEE, with two different shredders, one specialized for ELV’s and one for WEEE. The incoming ELV’s are de-polluted and subsequently shredded for the recovery of ferrous scrap. 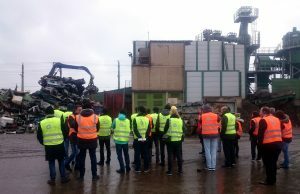 The shredder residues are transported to MGG Metran, the Post-Shredder Technology specialists of the Müller-Guttenbrunn Group (picture). MGG Metran is specialized in Post-Shredder Treatment of the shredder residues. It combines a large number of innovative separation technologies to further process these shredder residues into a range of non-ferrous metal concentrates. The recovered materials are re-introduced into the material cycle. In these processes also a valuable plastics fraction is created, which is delivered to MGG Polymers for further processing. 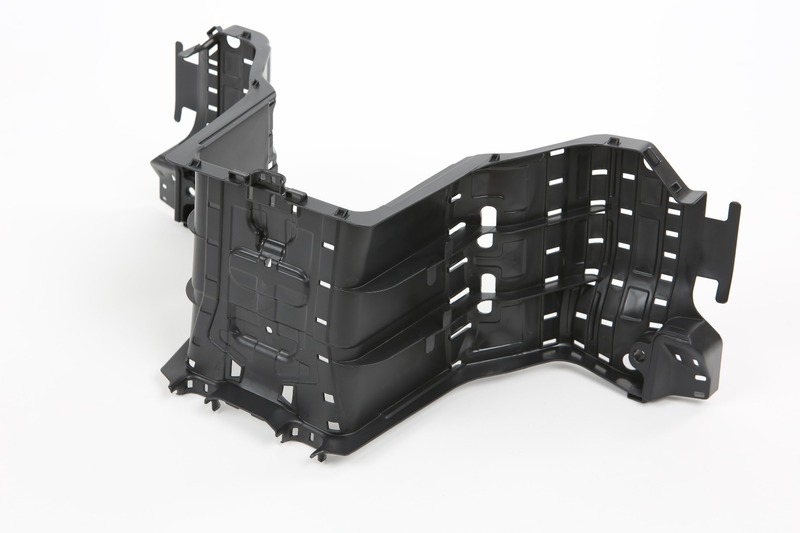 MGG Polymers recovers high-quality post-consumer ABS, HIPS, PP and even PC-ABS plastics and converts them into resins for use in demanding applications in the Car and Electronics producing industries. These post-consumer recycled (PCR) plastics reduce energy consumption by over 80 – 90% and protect the environment by reducing up to 4,8 tons CO2-emissions per metric ton of plastics produced, compared to the production of one ton of “virgin” plastics from petrochemicals.